You are here: Home / Reviews / Does “The Anatomy Of Peace” Practice what it Preaches? Ever bit into what you thought was a chocolate cookie and it turns out to be oatmeal raisin? It’s disappointing, even if the cookie is delicious. Likewise, it’s a pity that a well-known book in your religious circles is being misunderstood and poorly framed, undermining the very work it is meant to do. Rev. Hannah Adair Bonner (previously featured here) does some incredible behind-the-scenes research into the authorship of the “The Anatomy of Peace.” The book has been a mainstay resource for a critical United Methodist committee and has been required reading by many Annual Conference gatherings and delegations. The only problem is, these men do not exist. There is not a Dr. Yusuf al-Falah who teaches at Arizona State University. There is not a Camp Moriah in the wilderness near Phoenix. It wants us to say “there were good people and bad people on both sides.” When we take all these teachings and critiques of the oppressed out of the mouths of a fictitious Palestinian Arab and a fictitious African American scholar, and place them in their rightful context in the mouths of the white men that truly created them, it becomes quite a different conversation. Why place this between an Israel and Palestinian man? It may interest you to look at the recommendations at the beginning of the book to see that among them are two Former Director Generals of the Israel Ministry of Foreign Affairs, and the Former Chief of Staff of the Prime Minister of Israel. Not a Palestinian in sight. Rev. Bonner names an uncomfortable reality: in a climate of concern over “who is speaking,” the temptation is great for White Men to put their experience in the mouths of persons of color (POCs) and cultures rather than their own. The line from the preface “These characters are each of us” isn’t right when it is mostly white males writing it. While some characters are based on real-life people, most of the Persons of Color are not. The problem is that the “white people writing POC characters” worked: the book was a success and is part of the underlying process to remake United Methodism. Large swaths of The UMC may believe they are reading the first-hand narrative when they aren’t. I ran an informal Facebook poll, and as of this publication, 60% of my educated friends didn’t keep in mind the characters were fictional. The authorship matters because it undermines the book’s actual good goal: We need the Anatomy of Peace. We need to get out of the boxes we put ourselves in. We need to stop justifying our betrayal and develop hearts of peace. We need these things because advocacy groups continuously drum-beat the heart of war and are so good at it. We need hearts of peace, and we can’t fight fire with fire and come out unburned. But we also need to be honest when we say that this is a white committee’s claim to what African American protestors and what Palestinian tear-gas-endurers need to be doing differently. Are they right? Maybe. But by using fictional POCs as vehicles for white people’s beliefs, they have delivered a treatise on the heart of peace by using their hearts of war through objectification. I get that the forces wanting to keep churches and cultures from progressing forward together don’t like this heart of peace process and want to keep us from embracing it. The temptation is to urge us to see the forest through the trees. But there are many problematic lines that need reframing and reinterpreting in order to better use this resources moving forward in the very difficult scenarios in the church and world. So, what do we do with this book when it is revealed it is white men telling black protestors that they “want the tear gas” or Israeli endorsements on a book about the Holy Land conflict? Do we hold it the same way as when we eat at a white-owned Mexican restaurant: we know we are not eating the real thing, but we like the experience anyway?? Or do we set it aside entirely and say its process for delivering its method is flawed? For me, I would say read it again and the lines you underlined or felt impacted by, add in the margin “a white man says” and see how it changes the context. If it doesn’t change the meaning to you and a community of POCs that you are connected with, then hold onto its truth. If it does change, then let it go and read more literature by Persons of Color, or liberation theology by people in the Middle East or the Black Lives Matter movement in order to hear from actual lived experience instead of the theoretical. Thanks for reading, writing, and commenting. And be sure to read Rev. Bonner’s blog post! 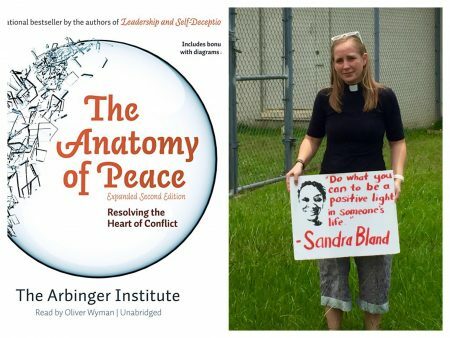 Someone said something to the effect that if you are a leader of any kind in the UMC, you have probably been invited to read “The Anatomy of Peace.” I guess I’m not a “leader” in the UMC, because I never got the invitation. I haven’t read it, and I won’t. I’m only slightly curious; it’s hard to believe it deserves a place ahead of all the other important reading I have yet to do. Right now I’m reading “Murder on Shades Mountain: The Legal Lynching of Willie Peterson and the Struggle for Justice in Jim Crow Birmingham” by Melanie Morrison and “The Pine Island Paradox: Making Connections in a Disconnected World” by Kathleen Dean Moore. Both hold for me greater promise to dismantle my silos and inspire me to action for the common good. But like “The Anatomy of Peace” neither names the elephant in the room regarding the church’s impasse over authority. Is it really worth reading twice? I found the first book incredibly helpful, but I’m glad I’m not the only person who found the over-reliance on fictional characters to make the point of this book troublesome. The third book is somewhat redemptive, imho, though. But they could likely have stopped at the first book and its accompanying training. I read the book. Kept looking for real life case studies where this process was put in practice and actually worked or didn’t. I was unimpressed. Maybe it was just me but I saw this as purely fictional but giving us the opportunity to explore the basics of what they are saying. I didn’t realize the authors or their colors and as a white male, I might have felt a subconscious comfort in how the words were written. However, I know that there was/is a camp in Maine where young people from Palestine and Israel come together to explore peace. Maybe that is why I thought such a relationship was possible and plausible. I plan to listen to it again, not to judge the authors but to pick up the lessons that are taught within the book. Boiling it down with the hope of experiencing an amazing maple syrup (It takes 40 gallons of sap for one gallon of maple syrup) of grace and hope moving forward. I also find it interesting that you raise the issue in regards to your denominational struggle over homosexuality, yet you do not suggest readings from those seeking justice for LGBT community.